From: National Museum of Health and Medicine. By: Reeve 032288. Published: Reeve Photograph Collection, World War I.
London’s Medical Officer of Health reports documented important information concerning public health conditions and diseases in the London area from 1848 to 1972. Their reports included information about lice infestation and disinfection methods used by different facilities. Public Health Inspectors in the City of London inspected public lodging houses, finding lice infestations in about ten percent of inspected beds. In these lodging houses, beds were kept in close proximity, facilitating the spread of lice from bed to bed. Likewise, the transmission of lice from material to material often occurred in other institutions, especially ones lacking proper means of lice disinfection. In addition to lice infestations, people in London faced difficulties getting rid of bed bugs during this time (Velten, 2016). With hundreds to thousands of cases of lice documented in each district of the greater London area per year, efficient and effective disinfection was vital to prevent infestation reoccurrences and to improve public health conditions. Dating back to the 19th century, innovative individuals were coming up with ideas to eradicate bugs. Graham Mooney documents the progression of disinfection methods over time in his book Intrusive Interventions: Public Health, Domestic Space, and Infectious Disease Surveillance in England, 1840-1914. Washington Lyon worked in the field of chemical disinfectants and served as the chair of his local sanitary committee. In 1870, he took an interest in the process of vermin disinfection, which lead to his Steam Disinfector patent ten years later. Before 1880, the primary method of disinfection was George Fraser’s dry heat disinfector. His disinfector was in high demand until “these machines came under intense scrutiny and were shown to have fundamental flaws” (Mooney, 2015). Further testing revealed that simply applying hot dry air to infected material did not thoroughly disinfect bulky items. Washington Lyon’s patent Steam Disinfector immersed infected materials in hot steam under high pressure inside a large iron chamber. His patent quickly gained popularity over existing disinfection methods. Reports from Bethnal Green (1880) described the key parts of the apparatus that worked together for effective disinfection. Like a steam boiler, the Steam Disinfector contained an interior chamber to hold infected materials. The materials were transported into and out of the chamber through two doors on a large basket-like “truck” that moved on railings. An outer casing, or “jacket” around the interior chamber held the high-pressure steam before it was administered to the internal chamber through an inlet valve. Following an hour of steam disinfection, the steam exited the inner chamber through an outlet valve. “The Washington-Lyon steam disinfect or for blankets, pillows and clothing” From: Sanitary Law and Practice; 2nd edition. By: W. & Charles Robertson and Porter. Published: Sanitary. Reports from Bethnal Green (1883) further explained the steam disinfection process. First, infected materials including clothing, sheets, mattresses and furniture were wheeled into the chamber on the truck and the chamber door was closed, providing an airtight seal. Next, steam accumulated in the jacket space at a pressure of 20 pounds. This high-pressured steam entered the interior chamber through the inlet valve, penetrating materials inside at a constant temperature of 260 degrees Fahrenheit for thirty minutes to an hour. Finally, the steam was blown off the materials to keep them try and the other chamber door was opened to wheel the materials out. The entrance and exit were separated to prevent contact between infected and disinfected materials. Lyon’s patent Steam Disinfector offered multiple improvements to hot air disinfection, creating a more effective way to get rid of lice after infestations. Studies found hot air to only partially penetrate materials inside disinfection chambers, raising the material temperature to only one half the temperature of the hot air administered. On the other hand, steam can fully penetrate materials and raise the temperature of the material inside disinfection chambers to the same temperature as the steam administered (Bethnal Green 1883). The intense conditions that the Steam Disinfector imposed on lice infected materials made it highly unlikely for existing lice or lice eggs to survive. Lice eggs under such high temperatures and pressures typically expanded until they exploded. The successful results demonstrated by Lyon’s patent Steam Disinfector were so convincing that the Local Government Board of St Luke (1896) stopped granting loans for the construction of dry heat disinfector, only funding the construction of Steam Disinfectors. Medical Officer of Health Reports from a range of districts noted additional advantages and improvements the Steam Disinfector brought. Infected bedding and clothing was either disinfected or destroyed by burning the material (St Giles (Camden) 1892). With improvements in disinfection techniques, the number of items that had to be destroyed rather than disinfected was lowered. By 1904, Medical Officers of Health from Bromley reported using steam to disinfect 374 beds and using fire to destroy only 2 beds in the course of the year. It did not take long for Lyon’s patent Steam Disinfector to gain popularity after it was first introduced in 1880. Although originally created to solve vermin infestations like lice (Mooney, 2015), the Steam Disinfector proved to be helpful in disinfecting materials after exposure to infectious diseases like scarlet fever and small-pox (Willesden 1902). Reports from Bethnal Green 1887 included comments on how the “Washington Lyon Apparatus works perfectly” to purify infected beds, mattresses, pillows, blankets, sheets, carpets, rugs and clothes (Bethnal Green, 1887). The apparatus was a key component of disinfecting centers throughout the area. In Rotherhithe (1898), the Disinfector House added a Lyon’s Steam Disinfector. In addition to the double door component of the disinfector that kept infected materials away from disinfected ones, the strategically planned building had separate rooms for infected and disinfected materials. Just like Lyon’s patent Steam Disinfector replaced the existing hot air disinfecting apparatus, new disinfecting techniques continued to develop and improve Lyon’s Steam Disinfector. The Steam Disinfector was very expensive to build and repair. For example, a disinfecting and cleaning station in Hackney (1959) deemed their Steam Disinfector past the point of repair at a reasonable cost. By 1904, John Thresh improved Lyon’s Steam Disinfector and took out a patent for his new apparatus (1904 Patent Thresh Disinfector). His machine used a calcium chloride solution to create steam that could penetrate materials at lower pressures and complete disinfection in as little as fifteen minutes (Mooney, 2015). Thresh’s disinfector offered a safer, simpler, cheaper, more energy efficient and effective option (St Luke 1896). Washington Lyon’s patent disinfector was effective in its use, safe for all involved, and easy to use, but many different articles treated with the disinfector were unusable after exposure to the instrument due to the high-pressure steam (St James’s 1898). The current-steam, railway van disinfector was said to work more effectively and quickly than any other method at the time of its conception in 1918. It was capable of disinfecting bundles of clothing all at once, with the ability to disinfect up to 500 men every two hours. What made this disinfector revolutionary at the time was that it could be used on articles of clothing that did not need to be spread out to be effective. You could lay each article of clothing in a pile, cutting down the time needed in order for the machine to work properly. This is done by using a railway engine in order to disperse the steam to disinfect the articles of clothing and the people infected by lice (New Methods of Disinfection for the Prevention and Arrest of Lice-Borne Diseases). Disinfection was thorough and carried out using many different methods beyond Lyon’s patent disinfector to address the vermin problem in London (Velten, 2016). Chloride of Lime was used to disinfect soil, carbolic acid powder was used for dust-bins and restrooms, Sanitas Powder and Fluid was utilized for mortuaries, and permanganate of Potash was used in streets to flush alleyways. Articles disinfected included anything from aprons, to bags and beds, to coats, vests, and rugs. Essentially anything that someone could interact with where lice could possibly call home was dealt with (St Giles (Camden) 1893). Often times, the amount of articles that needed to be disinfected for any given borough annually was quantified in the tens of thousands, or even hundreds of thousands. Entire rooms were normally subjected to disinfection methods and often times if articles could not be fully disinfected, the article would be burned to destroy it (City of Westminster 1922). House visits were very commonly made to deal with lice exposure. Rooms that were subjected to lice exposure were typically disinfected by the use of formaldehyde spray. When disinfecting an entire room, it was typical to have a complete removal of bedding and wearing apparel and for books to be treated with formalin (formaldehyde) as well. The infected articles that were removed were typically brought to Disinfecting Stations, where these articles and people alike were disinfected and cleansed, respectively, by Disinfecting Staff (City of Westminster 1931). When rooms were subject to disinfection and they presented cases where infectious disease was a threat, the disinfection would be carried out completely free of charge. When this was not the case, then charges were assessed based on the severity, as well as other factors, for the case. For school children, many of them were able to seek cleaning of themselves and disinfection of their articles through agreements made by their school and the London County Council (City of Westminster 1938). Arrangements like this were very common at the time, where different boroughs would reach out to the City Council in order to have proper disinfection administered, free of charge, by the government. These arrangements were seen to be mutually beneficial and improved health conditions for the entire city (City of Westminster 1959). The London City Council granted powers to each of the boroughs to “disinfect or destroy, compulsorily, not only articles which are verminous, filthy, dangerous, or unwholesome or likely to endanger health or promote infectious disease, but also any articles which are likely to be verminous by reason of having been used by any person infested with vermin” (St Pancras 1923). Special accommodations were also made for elderly people, sick people, and homeless people that came into the cleaning stations. At no expense to them, they would not only be deloused, but would also have their living property and possessions disinfected by the government (City of Westminster 1952). Arrangements to disinfect clothing became especially important during World War I and World War II. 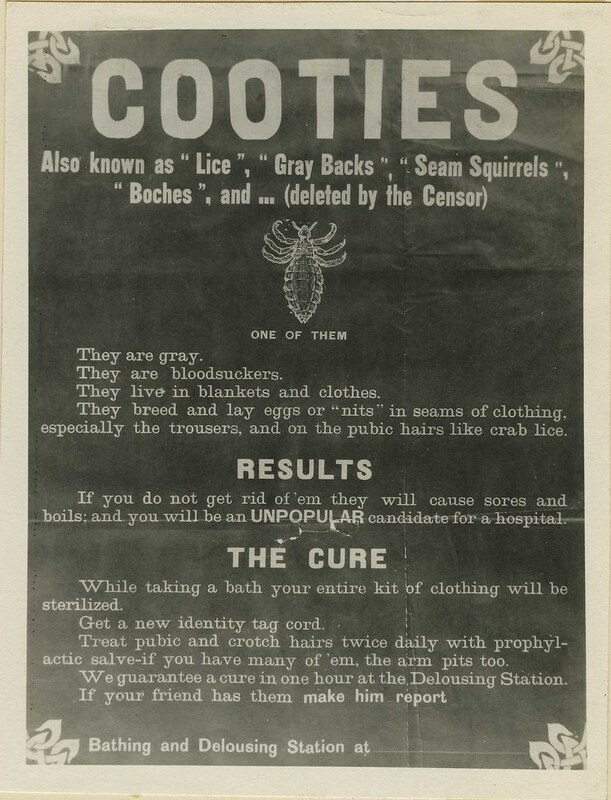 During and following each conflict, more extensive measures were taken in order to prevent the spread of lice and impending diseases resulting from lice. New Disinfecting Stations were created and more arrangements between schools, their respective boroughs, and the City Council were enacted (Hornsey 1943). After people, including children, were initially cleansed (often with soap and water), disinfection was still necessary in order to prevent further exposure and spread of infection from the lice. There was often a process where the site of the lice exposure would first be sprayed with formalin and then DDT solution would be used in order to reduce the chances of a re-occurrence happening (Camden 1967). DDT powder became a common mode of disinfection in the early-to-mid 1900’s. The insecticide was applied using dusting guns, which were shot into the openings in affected articles to kill the lice infecting them. Unfortunately, this method of disinfection using DDT and other insecticides, did nothing to the eggs of lice. Furthermore, in the 1960s, several studies concluded that there were insecticide-resistant lice in London. This led to alternative disinfecting methods, including the original steam sterilizers and fumigation. The former was difficult to use and inconvenient, as it required hauling around incredibly large instruments that could destroy clothes with their high temperatures. The latter was not an optimal option either, as the fumigants used for this method are not only volatile, but are also toxic to humans and must be handled with great care (A Simple Fumigation Method for Disinfecting Clothing or Bedding Containing Body Lice). “Infected bedding and clothing about to be disinfected in a Washington Lyon’s Disinfector, 1911” From: Dublin City Council. By: Unknown. Published: Dirt and Disease, Public Health in Dublin, 1903-1917. 22. A Simple Fumigation Method for Disinfecting Clothing or Bedding Containing Body Lice. 1. Mooney, Graham. Intrusive Interventions: Public Health, Domestic Space, and Infectious Disease Surveillance in England, 1840-1914. . Rochester, NY: University of Rochester Press, 2015. 3. Velten, Hannah. Beastly London: a history of animals in the city. London: Reaktion Books, 2016.